Many of the images are interiors of apartments. Large row houses lined McMicken Avenue in the area north of Brighton Bridge, with several families occupying a building, each on a different floor within a single structure. Apartments consisted of several rooms, including living room, bedroom and kitchen. In some cases, though, the bedroom and living room appear to be the same room, in the style of an “efficiency” apartment. 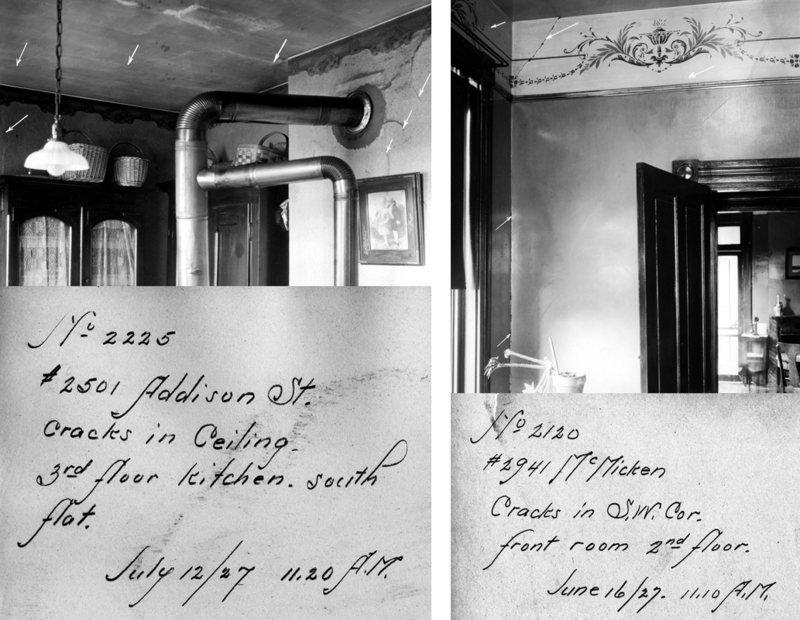 The caption on the back of the image below (on left) indicates a kitchen may also have served as a bedroom, since the caption reads “basement kitchen,” but there is a bed in the room. Depending on how many family members were occupying the apartment, this could very well have been the case. 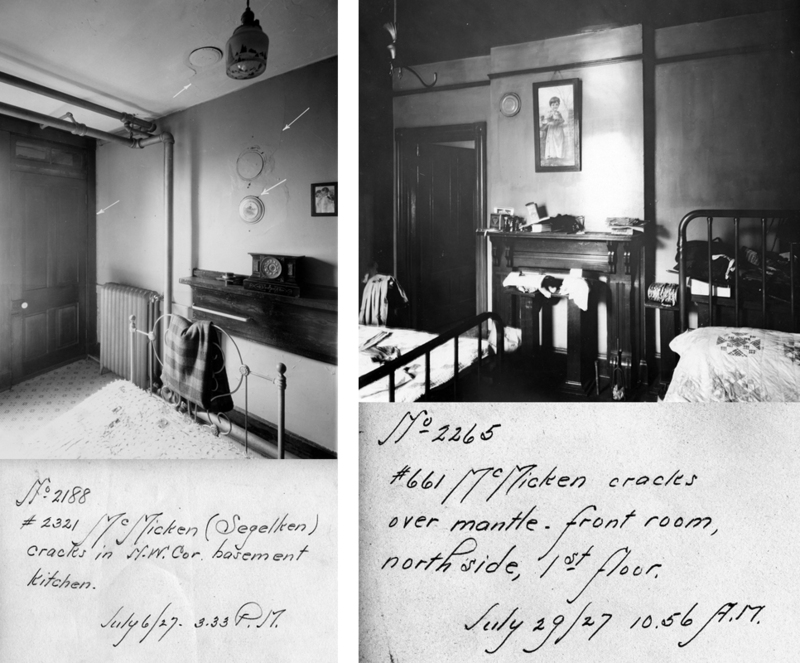 Whatever the circumstances, rooms were cramped in these row house apartments and amenities appear sparse. A cooking stove might also double as the main source of heat for the room. Laundry would have been done in the kitchen sink with scrub brushes, a ball of twine with clothes pins ready to be strung across the room on which the clothes would be hung to dry. Small accents such as framed pictures, mantel clocks or stenciling on a stovepipe cover (see enlargement below) added a bit of decoration to an otherwise sparse room. In other houses along the street, more opulent furnishings can be found. 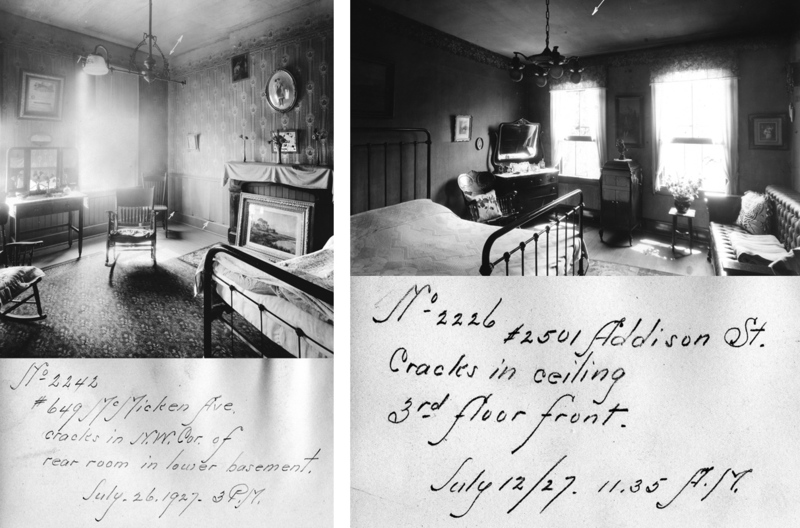 Rooms were larger, with parlors and sitting rooms separate from bedrooms and kitchens. 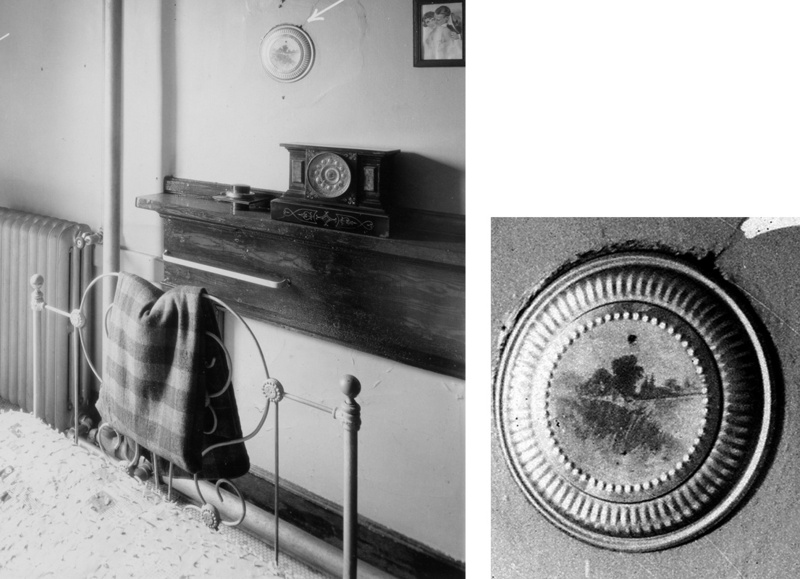 Hot water radiators were the main source of heat, and tailored curtains covered the windows. 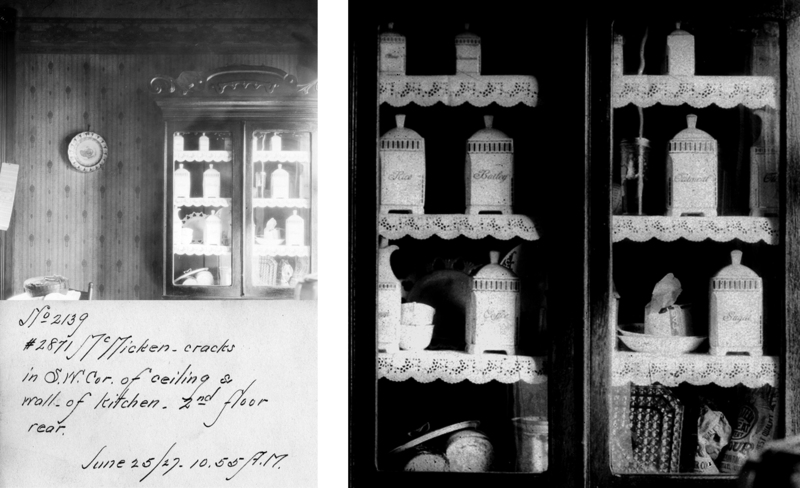 Large planters and framed pictures decorated these rooms, with oriental rugs on floors, china and crystal in cabinets, canisters for “Rice”, “Barley”, ”Coffee” and “Sugar” in cupboards (see enlargement below). 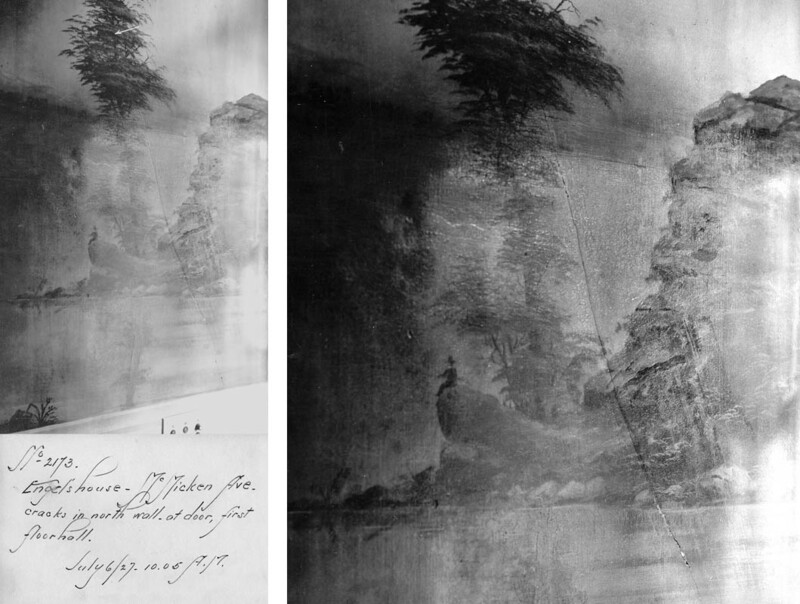 Walls would be papered or have scenes stenciled on the walls, such as the second image below of a man fishing at a lake. 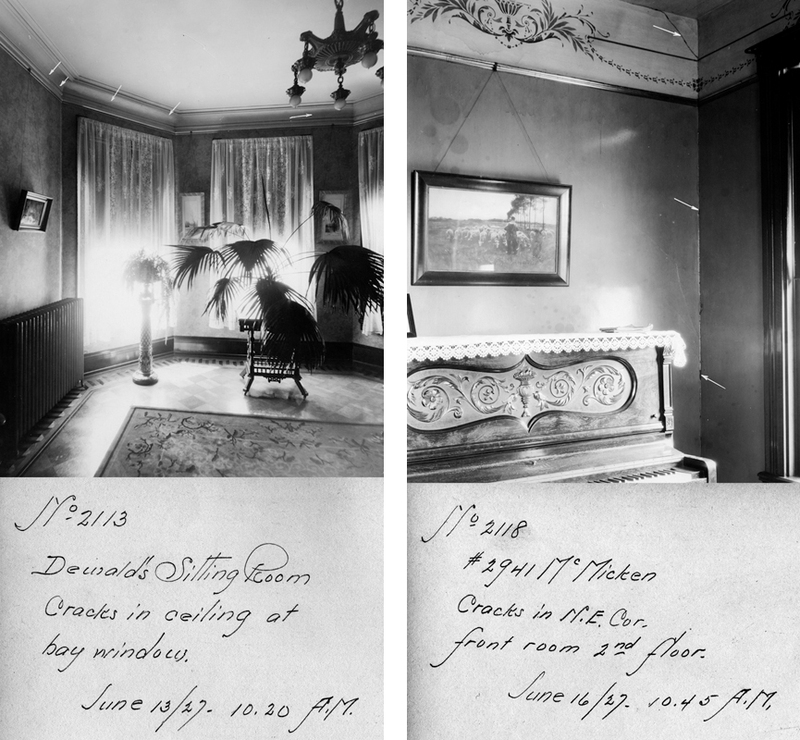 Bedrooms were nicely decorated, with sitting areas, overhead lighting fixtures and drapes. 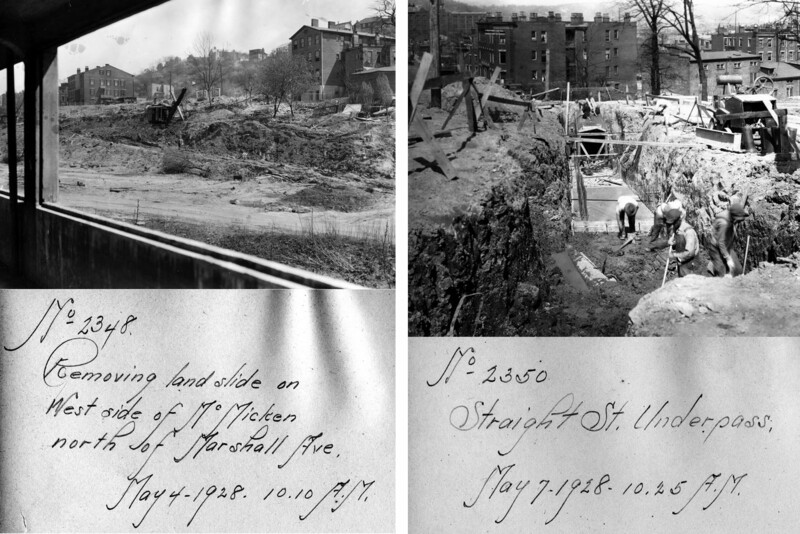 As construction moved northward up the old canal bed, some blasting and digging into the hillside at the foot of McMicken Avenue was required for the final section of underground tunnel to be constructed. This blasting left the hillside vulnerable to landslides, and caused extensive structural damage to the houses at the top of the hill. 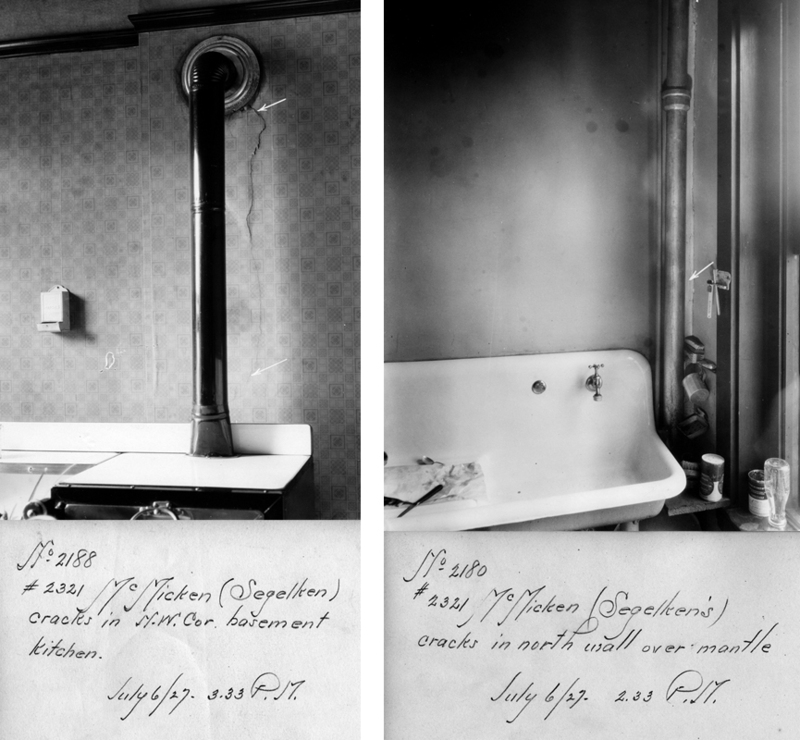 These photographs were taken by the Rapid Transit Commission as evidence for the many claims being filed by residents with the city for damages. But many houses were not salvageable; many had to be razed, such as those in the images immediately below. 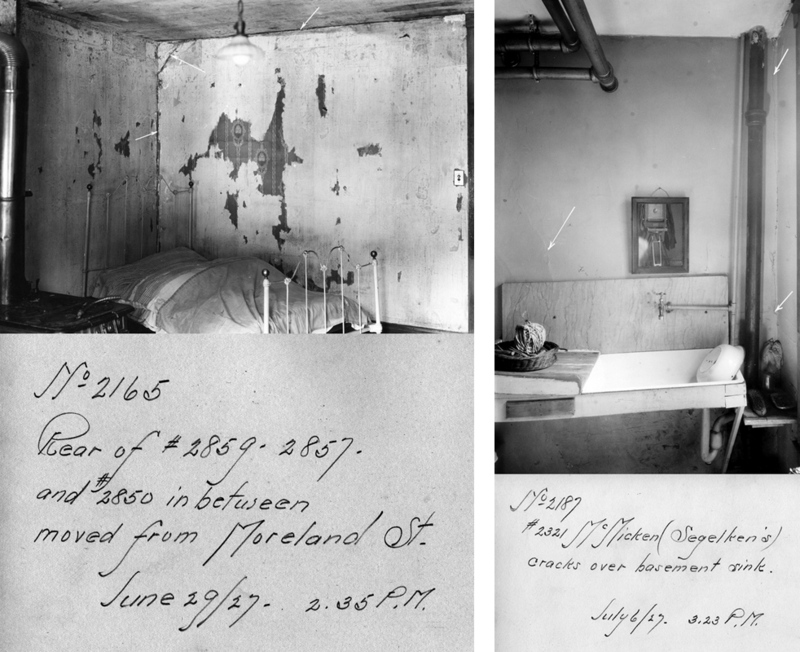 In the image on the right, the photographer recorded cracks in the backs of the houses on McMicken Avenue on June 29, 1927. 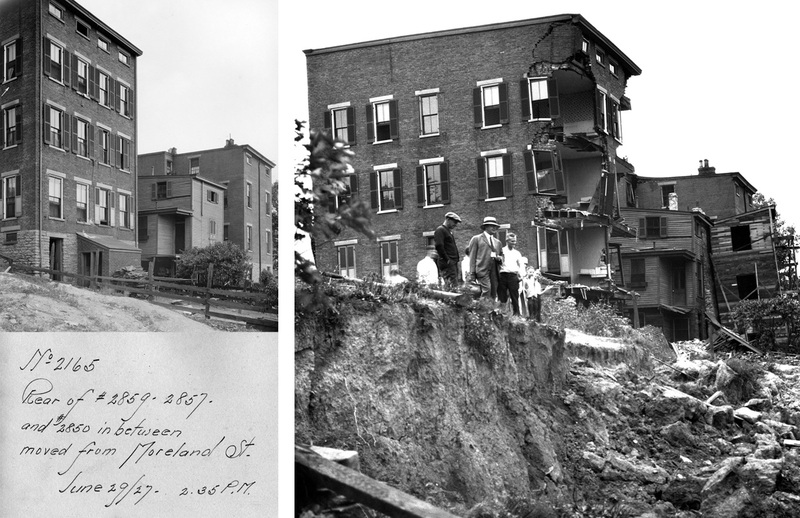 Heavy rains on Sunday, August 14 caused the hillside behind those same houses to give way, causing the buildings to break apart and slide down the hillside as seen in the image on the right taken August 18, 1927. Nearly a million dollars in damages would be paid out to residents by the city of Cincinnati. For more information on damages caused by the subway construction, see the Dec. 10, 2012 blog “Accidents Happen”.